The implementation of an effective e-rostering system can yield immense benefits for trusts and their employees. However, in the case of junior doctors, that level of effectiveness depends on whether a system can handle their idiosyncratic working arrangements, and the complex rules and regulations which govern these. A generic e-rostering solution, which may be fit for purpose across all other staff groups, may actually increase costs or put patient safety at risk if unsuitably adapted to roster doctors. With this in mind, The Royal Bournemouth and Christchurch Hospitals NHS Foundation Trust has been assisting Zircadian in the development of e-Roster – software that solves the unique challenges of managing junior doctors. 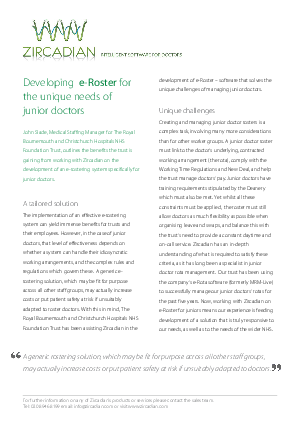 Creating and managing junior doctor rosters is a complex task, involving many more considerations than for other worker groups. A junior doctor roster must link to the doctor’s underlying, contracted working arrangement (the rota), comply with the Working Time Regulations and New Deal, and help the trust manage doctors’ pay. Junior doctors have training requirements stipulated by the Deanery which must also be met. Yet whilst all these constraints must be applied, the roster must still allow doctors as much flexibility as possible when organising leave and swaps, and balance this with the trust’s need to provide a constant daytime and on-call service. Zircadian has an in-depth understanding of what is required to satisfy these criteria, as it has long been a specialist in junior doctor rota management. Our trust has been using the company’s e-Rota software (formerly MRM-Live) to successfully manage our junior doctors’ rotas for the past five years. Now, working with Zircadian on e-Roster for juniors means our experience is feeding development of a solution that is truly responsive to our needs, as well as to the needs of the wider NHS.